I'm going to use bootcamp to the full though, and install XP for gaming and stuff. You've convinced me! I'm going Mac! Actually, I was already planning on ordering the Macbook Pro this summer but I'm glad to see other people have had positive experiences with it. Kenyon has also convinced me that Macbook Pro is the way to go. I blame you. Well done. Nice to see you're still alive. Still have JK2? 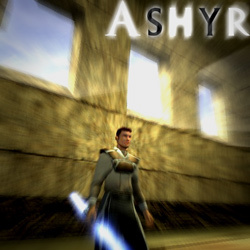 thanx, i found it cause i also play kotor I and II but yea i had to cut off some of the edges for it to fit. Heya, thanks, but it's a Majno original . Hey man, I know we've met before, just here to say I'm from Kansas. Please contact Mune a.s.a.p. Deadline tomorrow night although if you make contact and arrange a suitable time I may extend this to meet your requirements. Hi there. According to those crazy brackets, it's you and me in the first round of the tournament. Personally, I'm good Friday evening if need be, but prefer pretty much any time Saturday or Sunday. Holler back. EDIT: I'm in EST, by the way. This comment was edited by Mune on Nov 02 2006 03:22am. That depends. No jewelry, watches, glasses, shoes, belts, or any such accessories, they wear down the padding and scratch The Great One in annoying places. Oh, and no ugly people between 23:58 and 00:00 We call that time "Two Minutes to Midnight". During this time, The Great One stands on his balcony admiring his Kingdom. No uggos shall walk the streets and ruin His view. If you fail to adhere to any of these rules, you shall be punished by death, or worse, deportation from the Great Kingdom of Bubu Island. Oh, but first, fill out this 34526 page form to get a visa. Sweet. They are just so much easier and more reliable. What kind were you planning on getting? I'll be needing a laptop next year for school though. I imagine I'll need something Office-like in any case. So at the very least I'll need a mac that is excellent when it comes to battery-life, that is a nice computer for processing (programming, word-processing, ...) and generally not too expensive. This comment was edited by Bail Hope of Belouve on Jan 22 2006 07:37pm. You're a MAC-user, aren't you? For school I was obliged to use a Macintosh (an Apple iBook G4 to be exact) and I have to say that I loved it. I'm thinking about getting a Macintosh! Jesse is a very cool name wouldnt you say so? [Looking for unofficial Padawans To Train]Na'Dolo Site Here.